One of the activities the development team looks forward to every year are the Twitch livestreams. It’s a great opportunity for us to show our faithful fans what we’ve been working on to makes this year’s game the best ever. This year we have seven pre-launch streams packed with content running the gamut of our feature set. These include two brand new modes “March To October” and “Moments”. The only mode I play is franchise mode… I really hope this mode gets more love in the future rather than diamond dynasty. Wonder if that means a 4th commentator, or is someone getting replaced? No one has been replaced there is an addition to the crew. If you look closely you can see that the players are constantly chewing, or at least look like they are. So that’s been in the game for years and putting more animations in for seed spitting seems like a complete waste of time. Is there going to be new equipment? Online franchise is gone forever isn’t it?…. Another year another outstanding Show game comes out. I can’t wait to play it. I’m looking forward to the new features and changes to franchise and RTTS. 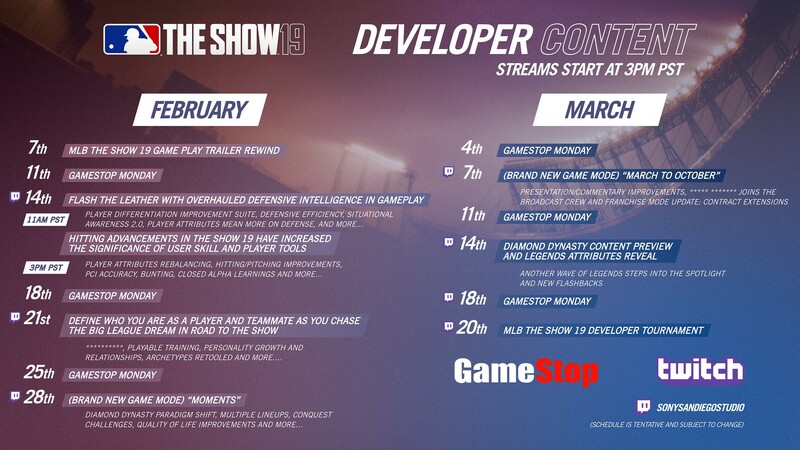 Is online franchise returning to mlb the show 19?I need to know. Doesn’t look like there is much of anything new for franchise. I hope I’m wrong. And how about some PSVR for RTTS? Can’t believe this hasn’t been done already. I am hoping for PSVR as well. If they don’t offer any form of VR, I will be skipping The Show for the first time ever. I have been buying MLB games since MLB 98 on PS1. I gave them a pass on not including PSVR support the last two years, but I can’t keep rewarding them if they arn’t going to take advantage of this tech. PSVR + Pitcher Batter Interface, is among the best possible usage cases for VR technology. I also agree. I bought MLB the show three years in a row, but then it started feeling stale. Updates weren’t big enough. So I skipped 2018. I would have easily bought the game if there was anything for PSVR. Even just the ability to stand on the pitcher’s mound in any stadium. That would be so incredible. My actual PSVR gameplay idea would be you can manage the game from the dugout and watch it play out before your very eyes. Of course a home run derby or pitching mini game would be awesome as well, but I’m not sure what sacrifices would need to be made to make it work on PSVR. Anyway, I’m probably skipping 2019 as well unless there’s a substantial update, and PSVR would be an insta-buy substantial update. Would love to see a VR mode as well! Didn’t they have a PS Move HR Derby mode for PS3 one year? Just having that in VR would be really cool! Ooh, making a note to check out that stream on the 21st. I’ve played Road to the Show for years, but went really hard last year. Curious what changes are comin’! Be sure to tune and find out :-). With it being a four-person commentary team, is it too early to say if the team will be made up of all MLB Network personalities or could the new addition be from someplace else? Baseball is seriously limited as a game by only having bats for weapons. It could really a battle royale mode and random item drops throughout the baseball match to liven things up. Will there be a online franchise mode.. I hope San Diego studios brings it back. It is so fun being able to build leagues and play them with groups of friends! Has anyone seen anything about this. I bought 18 and was disappointed they took online franchise out just to make more money on DD. Can your team add single player seasons in diamond dynasty, like other sport franchises do?? I’m really hoping they fix the online hitting this year. Ive been playing the show for years and its the only game i play consistently every day, and it pains me to say but the online hitting was an absolute mess and was never corrected to this day. I lost count how many times I completely squared up the ball perfectly only to hit a high infield fly or flew out to the outfielder, yet my opponent would (according to the PCI) swing OVER the ball, swing too much under the ball yet would hit a no-doubter. It’s infuriating. I never had this problem with any of the previous instalments of the series and I really hope this is fixed this year, so with all due respect I’m not interested in hearing about pre order packs and legends packs or whatever else because if the hitting isnt fixed then i’m not buying it, as sad as i am to say that because i have loved this series for a decade. 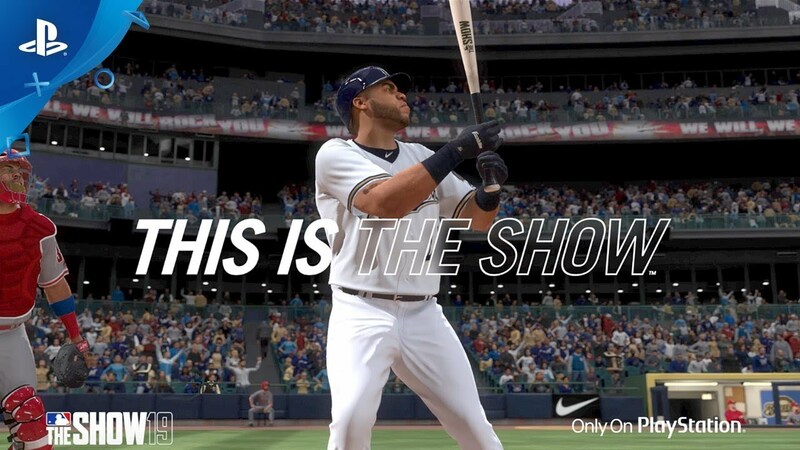 The hitting in The show 18, that is. Every year before that it was perfect.